Pinnacle Dazzle DVC 100 USB S Video PC DVD capture recorder. Condition is Used. Shipped with USPS Priority Mail. Support Microsoft DAB drivers. DAB radio: L-Band-1452960~1490624 KHZ. TV system: Full DVB-T and DAB compliant. Full DVB-T bandwidth reception. Receiving frequency: FM radio: 87.5~108 MHZ. Digital terrestrial video and radio programs recording. Scheda di acquisizione video EasyCap compatibile con Windows 8 / 8.1 / 10. Questo Grabber video è ideale per trasformare le tue vecchie videocassette VHS in formato digitale su PC. E' inoltre possibile trasformare il tuo computer in una stazione di Videosorveglianza! - Consente di guardare la TV sul PC e di memorizzarne le trasmissioni in tempo reale - Permette di giocare direttamente sul Pc alla Playstation o alla Xbox e di registrare le vostre partite per caricarle su youtube! - Convertite i vostri vecchi filmati in formato digitale ed editateli sul vostro PC con questo convertitore A/V USB 2. Marke TechniSat. Technisat SkyStar DVB-S2. PCI-Karte Fernbedienung. Kein Empfänger, keine Software, keine OVP etc! HDTV geeignet. Formfaktor PCI Sat-Karte. Sat-Standard DVB-S, DVB-S2. Skystar DVB-S2. LGHD2 is built for speed and quality. Tired of installing drivers?. Don’t you worry. LGHD2 doesn’t require driver installation. Insert it into a PCIe slot and it’s ready to roll. The design of the inner box is also carefully thought through. This is a elgato video video capture device. I used it for transferring vhs home videos to my computer. It was only used for 2 days and than has been properly stored. Does not come with original packaging. Includes vhs-c adater and video capture device. Please ask if you have any questions. No returns. Happy bidding. El gato is in great shape, works great. My just wasn't compatible with my old laptop. Full Warranty. New in The Box . In excellent condition. Fully working. You are bidding on an elgato HD60. There is NO RESERVE and FREE SHIPPING. Bidding starts at $1 Someone will be getting a great deal on this. GOOD LUCK! AGPteK, HDMI Game Capture Card HD Video Capture Recorder 1080P HDMI HDMI/YPBPR. Condition is New. Shipped with USPS Priority Mail. HENXUN USB 3.0 Analog HDMI Video Capture Device. Standalone, record video audio to usb flash or SD card(support FAT32 / NTFS, 64GB Max.). Following with HDCP suggestion solution as reference. No computer is required to utilize the recorder. 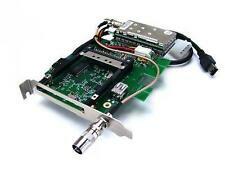 Scheda di acquisizione video / playout Blackmagic Design Decklink PRO PCI with breakout cable (SDI In/OUT SPDIF). Full working 100% ok complete with breakout cable (SDI IN/OUT SPDIF) as you can see in photo. This is a good deal --great price! so grab it now! AJA Kona LHi (A). Manufacturer AJA Kona. RAID Cards. Graphics Cards. 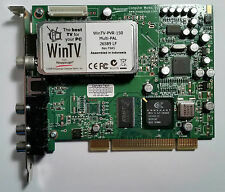 Video Capture HDMI PCI-e Card. Ports HDMI, SDI, HD-SDI, RS-422. Part Number Z-OEM-LHI-NC. Drivers Included None. Local Pick-Up available at no cost, Call in advance to schedule a pickup. You'll then be prompted to fill in your billing and credit card information. This Video interface card is tested and in great working condition. RECentral 3 - Support Live Editing, Customizable Quality Settings, and Content Overlay for Stream & Record. Video Capture & Editing. Maximum Capture Resolution: 1080p60. Plug and play support for Windows (except Win7). Roxio Easy VHS to DVD. Compatible with Windows 7, Windows Vista and Windows XP. Easily transfer video from VHS tapes or analog camcorders to DVD. Capture your VHS tape videos and burn them directly to DVD discs. Supports most analog camcorders, VCRs, or even DVD players. Capture video at full DVD quality resolution. Transfer your videos to an iPod or a PSP. Transfer your collection of LP's and tapes to CDs or transfer them to portable players. Label the songs automatically with title, artist and genre information. Opened but unused. Please see photos for full description. This product pulls you out of complex devices which are at high costs, as it turns your PC into full-featured video recording and editing workstation. Type: Video Tapes To DVD Converter. Audio input: Stereo audio (RCA). ION VCR 2 PC USB VHS Video to Computer Converter like new w/ disc usb & per cord. This was stored in my mom's sewing room for years. It looks like she never used it. Powers up nicely. It was briefly installed in a server and tested for functionality, but the server was never used, so the card wasn't either. Only the card is included, not the original box. SiliconDust HDHomeRun Connect Duo 2-Tuner - HDHR4-2US . Condition is Used. Shipped with USPS Priority Mail. Capture old VHS, Beta, 8mm or camcorder tapes and convert them to DVD and other digital formats. Video conversion for Mac provides everything you need to easily convert your videos to digital formats. Sharing your legendary matches could never be simpler. 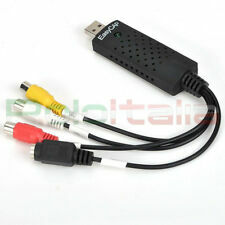 LGP Lite adopts USB interface and works perfectly with a tower PC or laptop. With the advanced H.264 hardware encoding technology, LGP Lite takes care of the HD video processing and avoids CPU overload. AVerMedia Live Gamer HD . Condition is New. Shipped with USPS Priority Mail. Video capture kit, never used but the box is a bit tatty. Hauppauge Impact VCB - PCI Video Capture Card - NTSC + PAL Grabber Videokarte ! It is also the world's first tool to record HD videos via HDMI to Android phones directly. With this excellent software-and-hardware combination, you can capture videos from any video source and keep them in your collection quite easily. Ultra sensitive digital terrestrial TV & Radio reception. Turn your PC or Mac into the perfect TV. Have you thought about cutting the cord and forgetting about cable TV?. The CONNECT QUATRO works with our DVR service, so you can watch, pause and record. Receives free OTA Live TV ?. No more expensive Cable TV subscriptions or cable boxes rental fees. 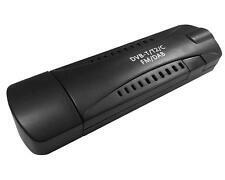 Product Model #: USB3HDCAP. Capture a High-Definition HDMI, DVI, VGA, or Component Video source to your PC. The USB3HDCAP USB 3.0 All-in-One HD Video Capture Device lets you record high-definition (1080p) video and stereo audio to your computer from an HDMI, DVI, VGA or Component source, through an available USB 3.0 port. 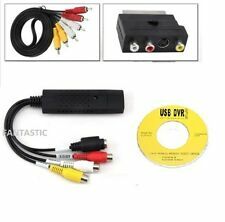 For sale is a ADS Tech API-555-EF Pyro A/V Link Analog to Digital Video Converter “NEW”. Item is brand new but box has been opened. I took several pictures to show all that is included. I only do shipping in the USA. Thank you for looking and please look at my other items for sale. Any questions please email me. HDMI & AV Cables Included. Capture HD 1080p/720p Video (with Audio) From HDMI Video Sources. - Record From HD & SD Video Sources (with Audio). The large 3.5" LCD and built-in speaker allow you to preview the audio & video being recorded. (Convert your VHS collection and enjoy your old movies again. You can watch your digitized videos on your computer, tablet, smartphone, or your TV. 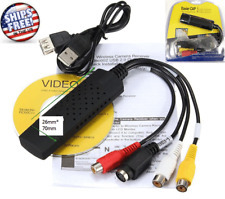 1) Connect your Video2Digital Converter to your VCR, camcorder, or any other video source. PCI Card Format - Full Length. Eight record streams (one for each tuner). FM stereo decoding. The Windows driver may be obtained. Up to 8 cards in one system. This video card is used, pulled from a working computer system that was dismantled. • Convert VHS and Betamax cassettes to DVD via your PC. VHS Video Cassette to PC 64 Bit Kit. Video Capture Software : Full version with serial number.For 64 bit versions of Windows 8.1 & 7. Video Capture Device. Item appears to be unused, but cannot say for certain. Supports NEC S401, S461, S521, P401, P461, P521, P701, X461UN and X461HB. Flexible connectivity with RJ-45 Ethernet Port, composite AV out and USB for firmware updates. I have 5 cards and 4 cables, so allocation will be random. Never Used Targa 16/32 NTSC Image Capture Board for ISA Computer Slot. Includes Original Software.